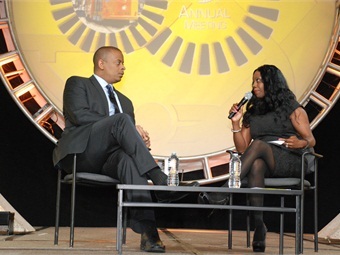 APTA Chair Valarie J. McCall’s (with Secretary of Transportation Anthony Foxx) top initiative for the year is collaboration both at the internal and external levels. A member of the board of trustees of the Greater Cleveland Regional Transit Authority (GCRTA) since 2006, Valarie J. McCall has been active in the American Public Transportation Association (APTA), holding increasingly influential positions, before eventually being named chair at October’s Annual Meeting. 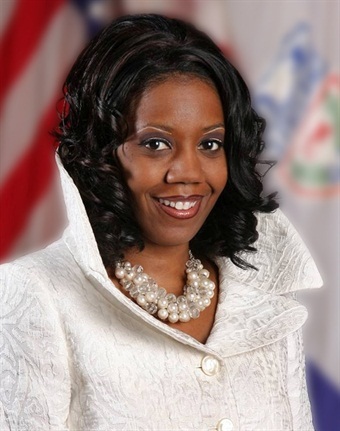 McCall’s full-time position is with the City of Cleveland, where she is the Chief of Government & International Affairs for Mayor Frank G. Jackson to local and state governments, federal agencies and international organizations. METRO spoke to McCall about her initiatives as chair for the next year, as well as GCRTA’s biggest challenges. WHAT EXPERIENCE DO YOU BRING TO YOUR NEW POST? I have been very active in APTA, particularly through the transit board member side as a member of the GCRTA’s board. I have been on the board there for about 10 years now, and one of the first conferences I attended was an APTA conference. From there, I learned that APTA truly is the leading voice for transportation and public transit issues, not just nationally, but internationally as well. Besides being a board member at GCRTA, in my day job, I serve as chief of government and international affairs for Mayor Jackson here in Cleveland. In addition, I have also served as the city clerk/clerk of council for the Cleveland City Council and ran the city’s empowerment zone. So, I have a unique, eclectic background of politics, advocacy, and economic and community development, not to mention that my undergrad is in social work. If you think about it, when we are advocating for people who choose to ride public transportation, those skillsets all help make me not just a more rounded chairperson, but one that understands and has touched these different attributes along the way. In addition to all of that experience, there is the skillset that I learned at APTA including working peer-to-peer with other transit board members and learning the importance of GMs and CEOs. It is one thing to be a board member in our world, but it’s another to take a step back and look at the rest of the world to see how their GMs are dealing with some of the same issues we are. They are doing it together with our business members, which really creates the backbone of APTA and keeps us moving. So really, being a part of APTA, growing at APTA and learning at APTA have really helped prepare me to chair APTA. In my day job, I’ve been participating in organizations like the National Leagues of Cities, the U.S. Conference of Mayors, and National Association of Regional Councils (NARC). So, while we are focusing on internal things at APTA, in terms of collaboration and making sure we can work more cohesively, it was equally important to me that we do the same thing with some of our external partners. APTA has many partners that we work with on a regular basis. I particularly singled out the three agencies I mentioned, for one, because I’m already involved with all three, but more importantly, our members are already involved with them, in some aspect, as well. When we tell people to go back to their districts and advocate for public transportation, they have to know who they are advocating to, which in many cases are the people associated with these organizations. What better way to get to know them than to bring these groups into the fold so we are already partners that are working together, which will allow us to further solidify our relationship and take it to the next level. By doing that, I think when you see the leaders of the U.S. Conference of Mayors or the League of Cities or NARC working hand-in-hand with APTA’s Michael Melaniphy; it will be a natural fit. It’s sort of like connecting dots that are really already connected. DISCUSS THE IMPORTANCE OF THE PASSAGE OF THE FAST ACT AND THE COMMUTER TAX BENEFIT RECEIVING PERMANENT PARITY WITH THE PARKING BENEFIT. First and foremost, I’m excited we have a transportation bill. Everybody knows the ups and downs we went through to get to MAP-21, but that was just a short-term bill that was meant to get us to where we are now, so the fact that we have a bill says a lot. Did it give us every single thing we wanted? No. But, while it may not have included everything that we wanted, it had a lot that we needed. Most importantly the bill set us up for the future. In the past, we were always rolling up our sleeves and fighting to keep stuff or to try to get money back. If you look at what happened with the funding of the bus program in the high-density states, it was a phenomenal win because it kept those high-density states whole. For an industry to say our seven states that have the highest number of passengers are equally as important as our communities that have lower passenger counts is a real testament to the work our industry put into the bill. As an association, I think it brought us even closer, because while we have a bill today, we know that we can’t rest on our laurels and have to start focusing on the future, which will include multimodal transportation options and technology. For example, at the BMBG’s Annual meeting, we had a chance to tour the new light rail system being built out in Honolulu, which will feature the first driverless train in the U.S. The project is not without its controversies, but at the end of the day these are the types of projects we have to start focusing on in the future. Part of what I think the passing of the FAST Act gives us is some sense of clarity, so we can now focus on what’s down the road. WHAT IS GCRTA’S BIGGEST CHALLENGE? If you think about where we are in the nation today, cities are building light rail systems that connect their airports to downtown, and Cleveland was the first city in the U.S. to do that. We started this trend, but now we need to replace the equipment that is there, while focusing on how we can add all the latest technologies along the way in order to stay ahead of the game. We are a city with multimodal transportation opportunities and rail is important to us. Currently, we are doing a lot of work to redo some of our stations and replace rail track, but it is all very expensive. Like many other agencies, we are also discussing fare increases and what makes sense. Do we raise fares to what we need to break even with the budget, or do we raise them enough to help us with some of the capital equipment needs we have now and will continue to have in the future? One good thing about GCRTA is we do a phenomenal job of planning and staying attentive on what our needs are. Because of that, we’ve invested our dollars smartly, and ahead of time, on all of the engineering and studies we need to be ready in the event there was some, like Phil Washington used to say, ‘manna from heaven,’ that will allow us to get into construction on a project. Despite the positive moves we are making toward keeping our system up-to-date, we still have a good $500 million of capital needs. Even though that is a big challenge, it is also a good opportunity. If we are replacing railcars and talking about the future of technology, we have to focus our thinking on the future of transportation, so that we have the opportunity to come out of this process with the latest and greatest railcar fleet in the nation. So there are some benefits in being behind, if you are prepared to move forward into the future.